264 parts (242 in dark olive plastic, 18 poly caps, 2 vinyl tracks, nylon mesh), price $20. Advantages: Better shape and detailing than ESCI T-55. Disadvantages: Motorization holes, chassis 5mm too tall, plastic may not be styrene, vinyl tracks. Recommendation: To anyone who likes Soviet/Chinese armor. This is a first look inside the box of this kit, which has admittedly been around a little while. With the granting of “Most Favored Nation Status” to the PRC some weeks past, the price of these new kits dropped from $35 to $20. With all the invective flying back and forth in the pages of Boresight I felt that I had to try one out. Besides I had always wanted to build a North Vietnamese Type 59 and here it was in kit form. The box is very sturdy, all being out of corrugated cardboard. Inside are three main sprues, two small sprues, a sprue of poly caps, the bottom hull and the tracks. The main sprues have lots of spare parts as they are designed to cover all the variants of the Chinese Type 59/69 and 79 tanks. For a basic Type 59 about 75 parts are spares. All the headlight variations are here as is all the IR gear. The bottom hull actually has the motor and gears glued into it. It is pretty easy to pry out and that was one of the first things I did after opening the box. The bottom hull has some nice detailing on the underside as I always figured it was not totally smooth as on the ESCI T-55 kit. The holes are rather easily filled as some actually line up with real access plates present on the bottom of real T-54/Type 59 series vehicles. The suspension arms are all separate and line-up correctly; the last one being reversed. The rear sprocket appears a little over sized however. The road wheels on the other hand are beautiful, and though at first glance they appeared to be copies of the ones from Dragon’s NVA T-34, this is probably not the case, as the sprue they are on does not resemble the one from the Dragon kit at all. The remainder of the kit is all new and this kit shares nothing in common with the ESCI or Lindberg T-55 kits. Test fitting the top on the bottom hull and just eye balling the road wheels, the kit does definitely sit too tall. There is a lip on the top hull, which helps lining up the two pieces, but it adds 3 to 5 mm to the height. If it is removed the kit appears to match the prototype much better, though it still sits 1-higher than the ESCI T-55, which I always thought sat too low anyway. I have measured the kit before the modification and it did sit 7 mm too tall according to my ruler. As the kit is not finished yet I will reserve judgment on how well it sits after the modification. The detail parts look all right, it’s certainly not on a par with current Tamiya or Dragon kits, but does compare well with a Tamiya kit of about 1976 vintage. The turret features some nice weld marks and the gun is off the centerline like the original, unlike the ESCI kit. The gun tube is the proper length and size at least in comparison to a Chesapeake replacement part. The fender braces are all hollow and petite. The DSHK machine gun is marred with sink holes and appears chunky, but is a better effort than the ESCI one. A big surprise and plus with this kit is the nicely done engine deck. The louvers are molded on the tope hull. The engine deck fits over this trapping in place the section of mesh supplied. It results in a very nice engine deck. No engine ‘m provided of course to view under the louvers, but Maquette does make one that you can find for about $6. The figures appeared under scale until I realized that Soviet tanks of this vintage require crewmen below the height of 5’3″. The faces appear too cherubic and I probably will replace them if I can find Asian tank crew figures. The tracks are awful rubber things that appear worse than the ones in the old Lindberg kit. They are best replaced with Modelkasten, who may also provide a replacement drive sprocket as well. I had heard that regular plastic cement did not work on the plastic used in these kits. I had to try it. Regular glass bottle Testors liquid cement does not bond the plastic in the kit well. The black bottle Model-master/Testors liquid cement does, as does Tenax, Micro Weld and the varied ACC glues. If anything, the plastic in the kit resembles the stuff coming from Zvesda in its vaguely rubbery consistency and the greasy feel to it disappears if it is washed in dish detergent or sprayed with Fantastik and wiped down before building. That being said the difficulty in gluing could just be an over abundance of mold release on the plastic and not due to its chemical composition, but I am not a chemist. Final verdict? 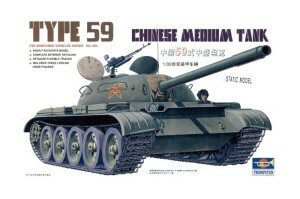 If you want a plastic Type 59/T-54, this is the kit until Dragon or Tamiya decide to do one. It is about equal to a Tamiya effort from the mid- I 970s, many of who still grace the shelves of hobby shops everywhere and that many still build. I don’t expect Tamiya or Dragon quality from any company in any communist or former communist country, the technology is not them, and the engineering is not there. Saying that this kit is equal to a Tamiya piece of 30 years ago is a lot more fair and more accurate than saying it is equal to the Aurora- 1/48th scale armor of the 1960s. The quality of this kit overall compares well with what was coming from Eastern Europe ten to five years ago and many of the detail parts in this kit compare well with Alan or Zvesda kits of current vintage. Speaking of which, with all the companies coming out of the former Soviet Union, how come none of them have yet produced a kit of the most common and most produced Soviet Bloc vehicle of the Post War Era? Until they do, I say try a Trumpeter Type 59/69/74.